Hats are a useful and necessary article of clothing. Hats protect our heads from the weather when it's cold and windy, and they provide shade for us in the beating sun. I SUPPOSE that, at one time, the whole idea for Head Wear was the "usefullness" of the thing. Today though, HATS... have become a way of sending a message about who you are, or maybe even how you are feeling on a given day. A hat can say "I am romantic and mysterious" or... "I am all BUSINESS"..or even... "I am playful and silly." By the same token... Hats can tell us of a persons trade... "He is a Construction Worker in his Hardhat", or "She is a Chef in her Chef's Hat"... or... "He must be a Cowboy in that big ole Ten Gallon Cowboy Hat." There are times that it is important to wear a Hat as you MUST be recognised for that particular position in life or work. Such as a Navy Sailor that wears a regular Sailors Cap... Whereas his Captain will wear a different type of hat all together. When we have a Renaissance Queen and Ladies all attending court...How will we know which is Queen without the proper Headgear? The Queen is likely to be wearing a Crown or a Bejeweled and Gold Circlet to show her station. While the Ladies in attendence would probably be properly attired in a French Hood, Headband Fall, or Silk Veil. Hats are so cool but there are just SO MANY!! I have come across a GREAT place for "HATS". It is a HAT STORE, believe it or not, and it has hats for every day wear... and hats for those strange moods we sometimes find ourselves in. MOODS that say "I feel like being somebody ELSE today."... or maybe just "I feel like being SILLY today so maybe I'll put on my "SILLY HAT for all to see!". 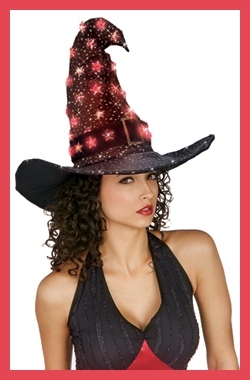 Since the whole IDEA of my site is "Costumes" I will try to stick to hats that are in that category... OR... HATS that are out of the ordinary to the point where I cannot help myself and I MUST show them to you. I will also post some hats from this store on pages fitting their theme. i.e. "Christmas Jester Hat" on Christmas/Holiday Pages.